The Bundling Method: Like the interweave method; bundling is accomplished by folding longer items around smaller items. However, bundling is done by outfit. In other words, if you plan to wear a particular shirt with a particular pair of pants, you bundle them together. Starting with socks and underwear, you then wrap the shirt and finally the pants. The Interweave Method: This works best with longer items such as dresses, pants, etc. Start with the longest items first, placing them in the bottom of thesuitcase, with the ends hanging over the case. Then place smaller itemson top of the longer ones. The Rolling Method: Roll clothing, especially garments like turtlenecks, pajamas sweaters,slacks, etc. By wrapping a rubber band around each item, they stay rolled up. Layering clothing with plastic dry cleaning bags or tissue paper helps to prevent wrinkles. Don't bring full sized toiletries. Many drug stores carry sample size toothpaste, hair spray, shaving cream, etc. These take up a lot less space and are much lighter than their full-sized counterparts. Also available at drug stores are small plastic bottles and jars that can be inexpensively and ecologically refilled with your preferred toiletries. Place jewelry,medicines, contact lenses, and other valuable or irreplaceable items in your carry-on. Also consider packing a change of socks and underwear in your carry-on. 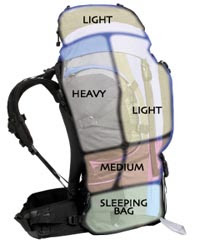 The Cross Packing Method: Pack essential items of each person in each other's bags. That way, if a suitcase is lost, everyone will still be able to enjoy their trip until the bag is found. Make use of dead space. Stuff underwear, socks, ties, scarves etc. into shoes. This not only saves space, but also keeps your shoes from being crushed.